Happy New Year! I wanted to kick off 2018 by reviewing a blockbuster title. One that would be worthy to ring in the new year with. 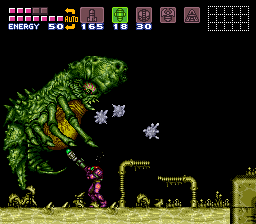 A few games came to mind but in the end I couldn’t think of a better choice than Super Metroid. 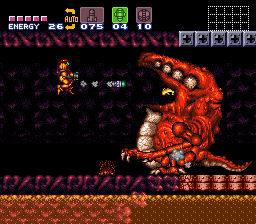 Considered arguably the greatest Super Nintendo game of all time, Super Metroid is an action platforming adventure unlike anything else you have seen on the SNES. 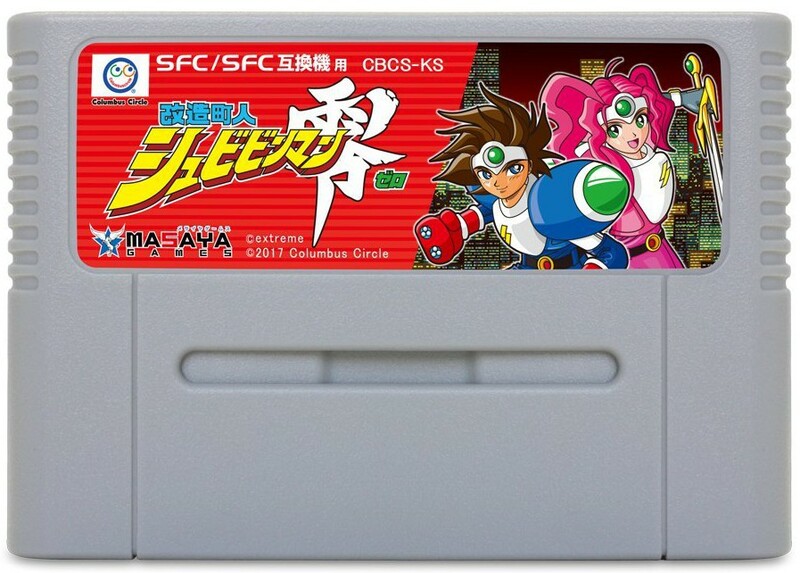 It’s a bonafide first ballot Hall of Fame classic that stands as one of the best SNES, nay, 16-bit, nay, video games of all time. 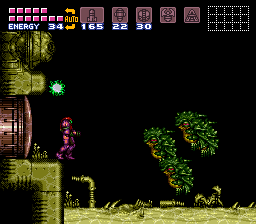 Few games are as atmospheric, immersive or engrossing as this 24 MEG masterpiece. 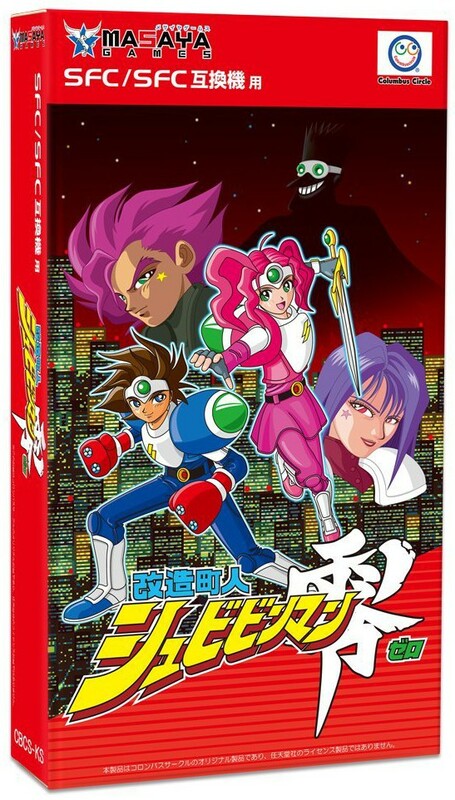 So grab your Grappling Beam, don your Power Suit and join me for a blissful jaunt down memory lane! 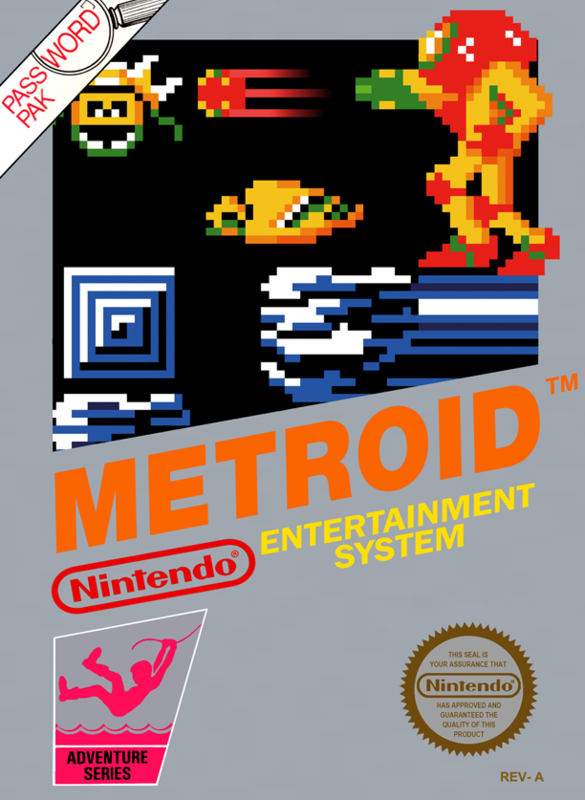 Metroid originated on the 8-bit Nintendo, arriving on the Famicom August 6, 1986. 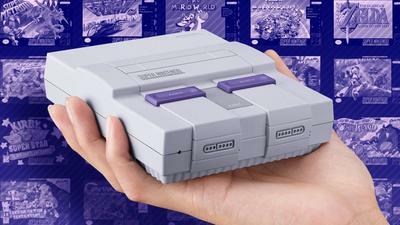 It landed in North America in August of 1987 and made quite the splash. 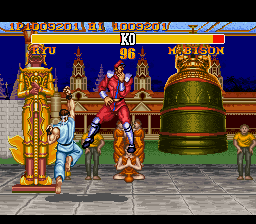 I remember my brother and his friends loving this game. Being so young at the time, I didn’t quite get it. But I watched them play it and I was enthralled. 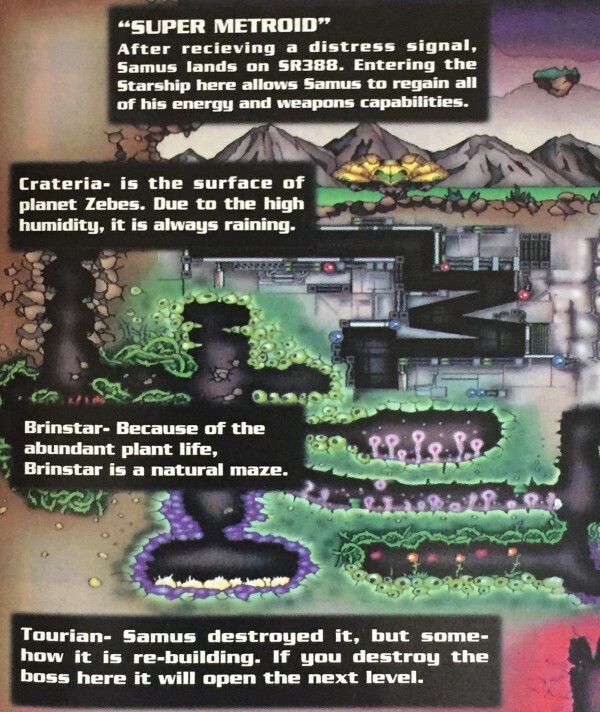 Nintendo had created a unique alien-like world. 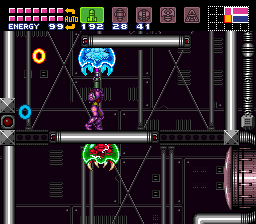 Bright purple and orange colors. It was like a Sci-Fi film come to life. 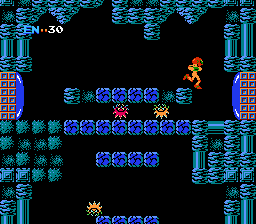 Metroid went on to become one of the NES greats. 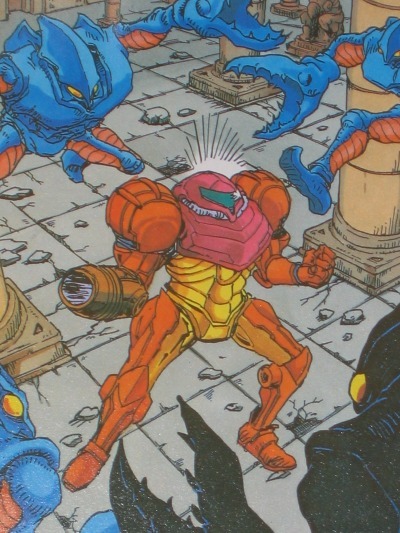 Often hailed as a benchmark title, it put players right in the shoes of one, Samus Aran. 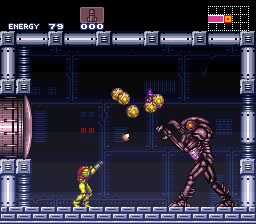 It’s hard to think about the NES and not think about Metroid somehow. 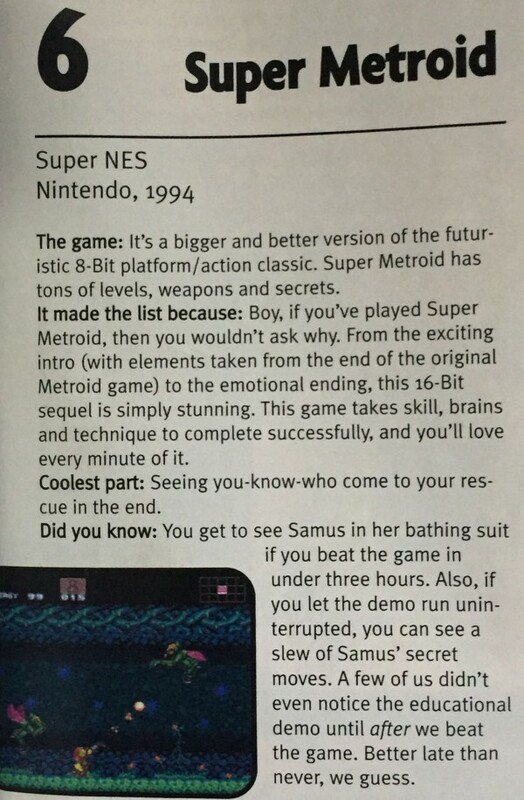 Naturally, when the SNES came along in 1991, everyone clamored for a Super Metroid. It took a while but the wait was worth it. 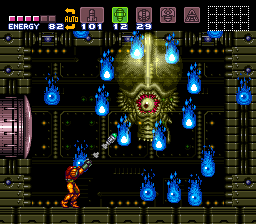 Years ago, having demolished a Metroid army and eviscerating the Mother Brain, Samus Aran descended to the planet known as Zebes. 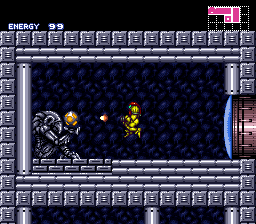 After Zebes was taken care of, Samus blasted the Metroid population of SR388 only to discover a hatchling. 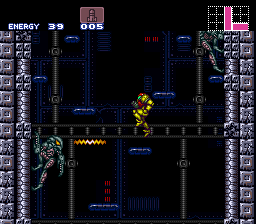 Samus took the Metroid hatchling to Ceres Space Station where scientists could study and look after it. 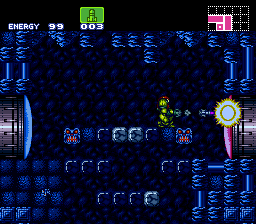 The scientists discovered that the Metroid hatchling had energy-producing characteristics. 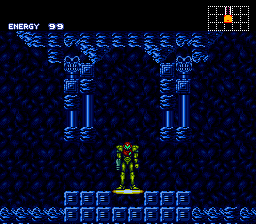 Answering a distress call, Samus returned to the Space Station to find the lab in ruins. 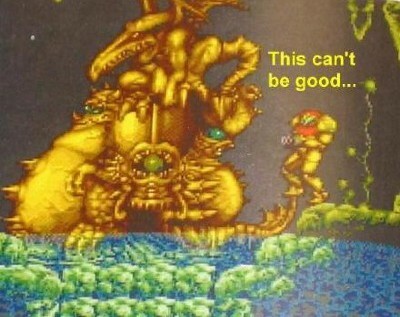 That wasn’t the only thing Samus discovered. 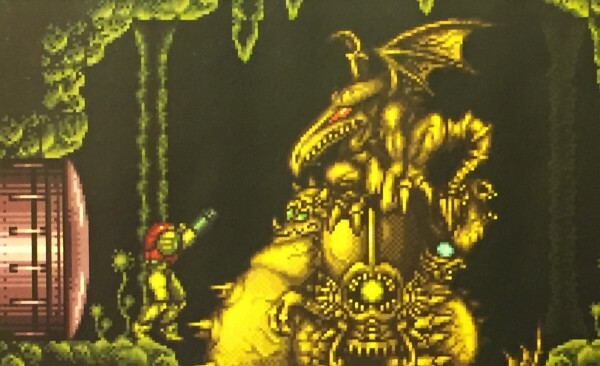 For there stood the Space Pirate Ridley, with the hatchling firmly gripped by Ridley’s talons. 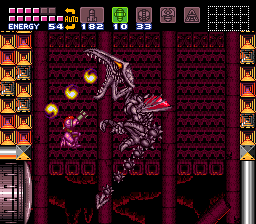 Samus and Ridley immediately opened fire on one another, turning the once peaceful Space Station into a violent war zone of death and destruction. 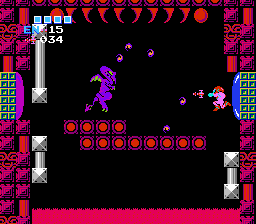 Without warning Ridley suddenly made its escape with the hatchling and took off for the planet Zebes. 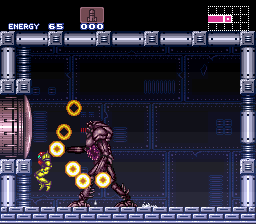 Ridley scales beautifully out of the screen, laying waste to what remains of the lab. Better get the F*CK out! 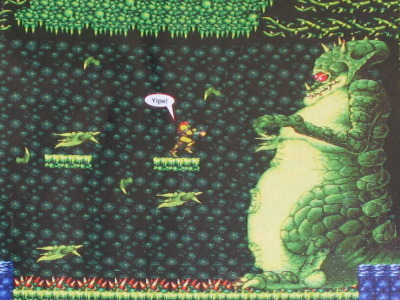 Unfortunately for you, many nasty monsters lie in waiting ready to rip your head off. Better find some upgrades fast to ensure yourself even a snowball’s chance in hell! 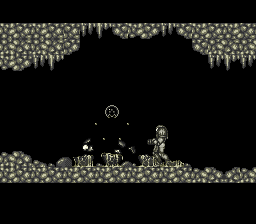 Between you and the hatchling lies countless chambers, catacombs, caves and chasms. Good luck! So satisfying to find a new item! 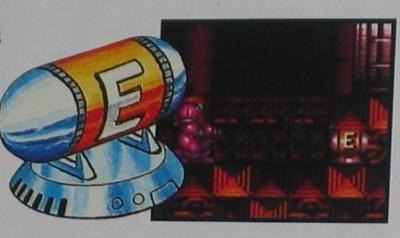 The Super Missile is the power equivalent of five regular missiles. You can carry up to 50. 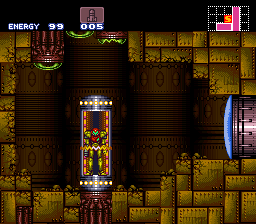 Certain doors can only be opened via the Super Missile. 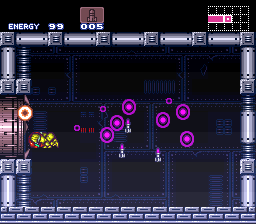 Bombs never run out and can send blocks sky high, leading to hidden passages. 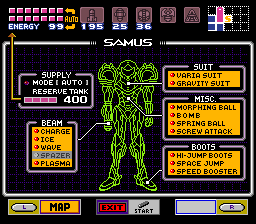 The Energy Tank stores 100 units of energy. A maximum of 14 can be carried. 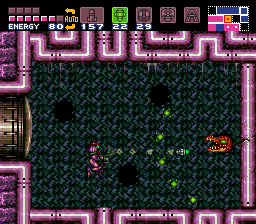 Crateria is crawling with all sorts of creepy creatures. 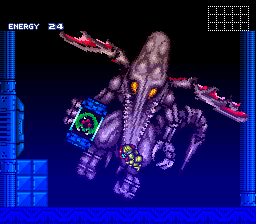 This guy is my favorite non-boss enemy. 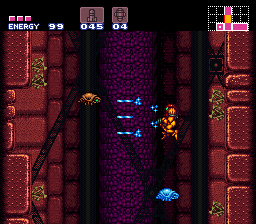 Zebesians are bipedal crustaceans with lobster-like claws and lethal laser beams. 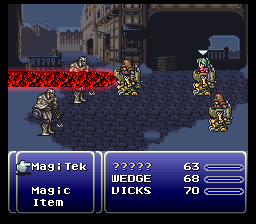 They attack often times in packs. Watch your back! 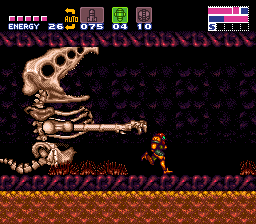 I don’t have many complaints but I wish there were a greater inclusion of bipedal enemies. As such, the Zebesians really stand out for me. 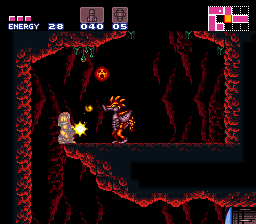 After securing the bomb power-up, the Torizo statue crumbles and comes to life! 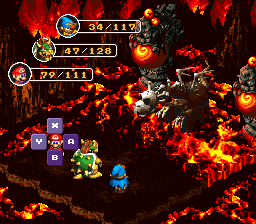 It’s the first official boss battle of the game. It’s a cinch but a nice introduction to the big bad bosses that await. 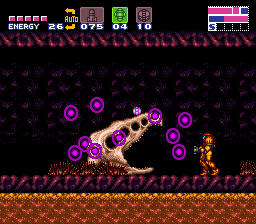 Samus isn’t one to get spooked easily but even this gives her some pause. Bust out the heavy artillery! 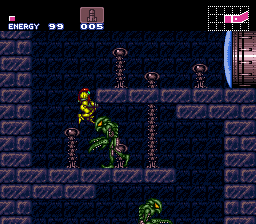 I never really played Super Metroid until a fateful Saturday night back in February of 2007. 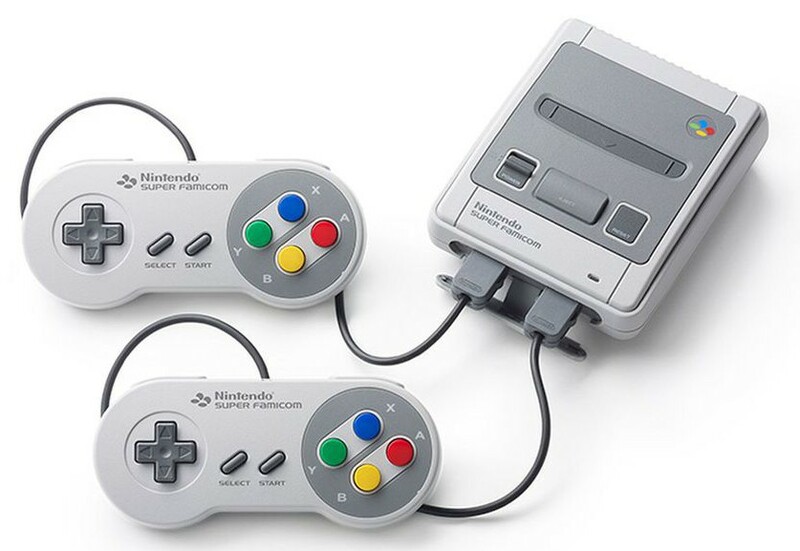 I played it briefly back in the spring of ’94 at KB Toys. 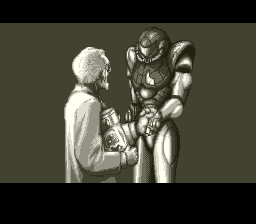 From those five minutes alone, I knew it was an awesome game. 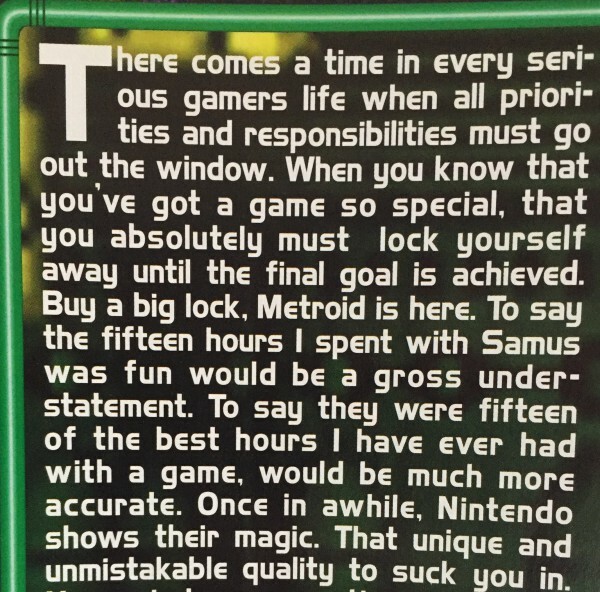 But I never got to play it thoroughly. 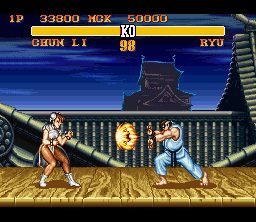 We never bought it as kids and the opportunity never arose. 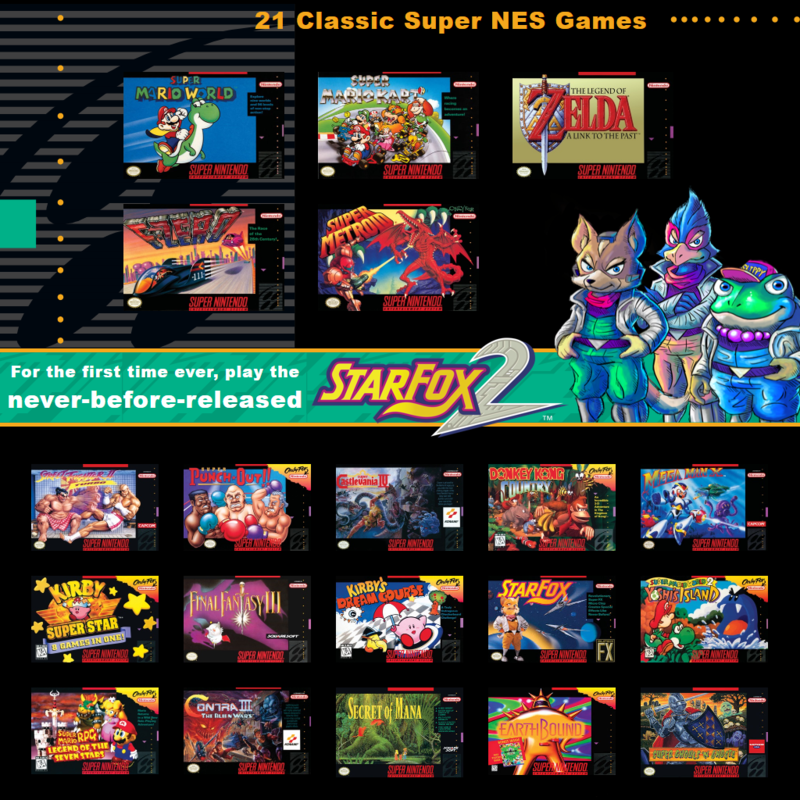 Getting back into the Super Nintendo nearly 12 years ago (January 17, 2006) gave me a second chance at gaming redemption. 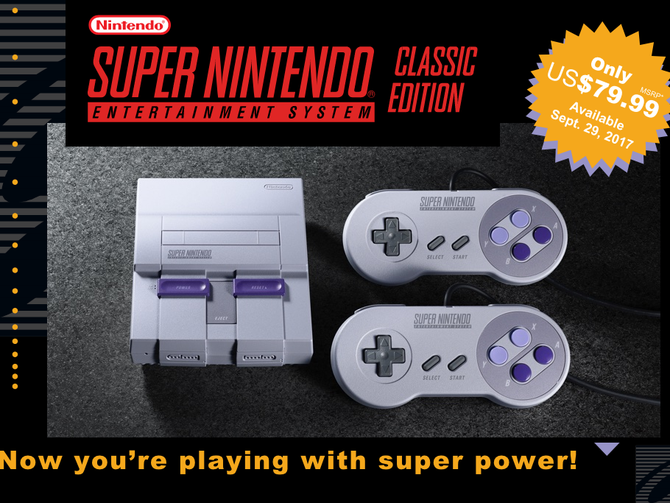 Not only did it live up to the massive hype and billing, but it absolutely shattered my gaming world. 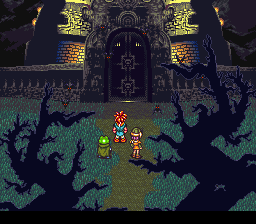 It was easily one of the best video games I ever played. And to this day I can still say that with all the confidence in the world. 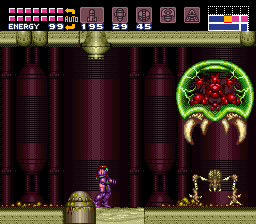 Super Metroid is a fantastic work of art. OK, whew, now that I got that confession off my chest, let’s carry on. 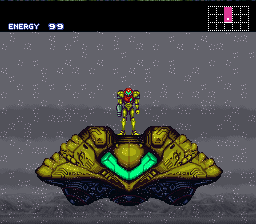 Samus begins the game atop her trusty Starship. 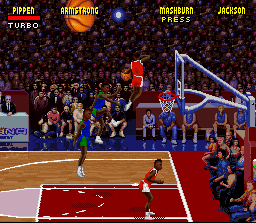 I remember playing this at KB Toys in ’94 and being blown away. 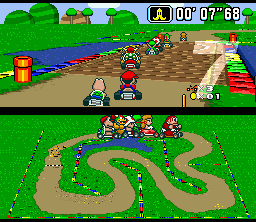 It’s such a small thing but I recall being amazed that the opening involves going left instead of the traditional right. 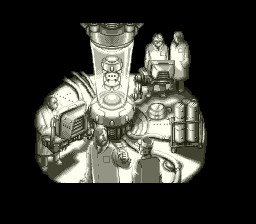 Speaking of unusual, not many games at that time had doors up top and below. 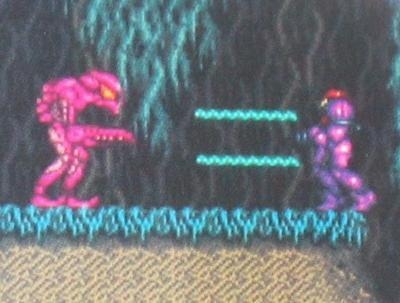 Such is the unique diversity of Super Metroid. The little details captivated my imagination and pulled me deeper into its world. 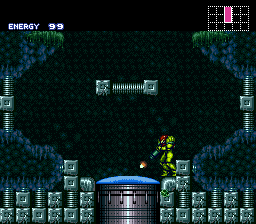 Atmospheric is a word often used to describe this game. Look no further than the elevator shafts. 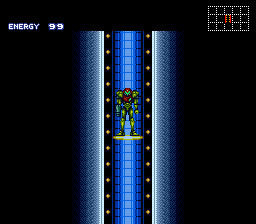 There’s a sense of anticipation and tension that percolates as Samus rides the lift to her next destination spot, knowing all too well that it could very well be her last. 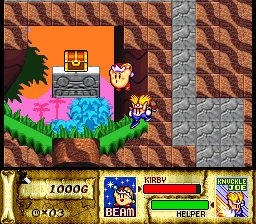 Collecting goodies and using them effectively is the name of the game. 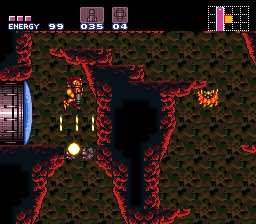 Zebesians and Geemers litter the caverns of Crateria. Bloodthirsty bats wait for you to come near before swooping in. 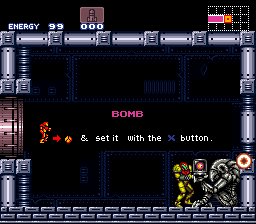 Congrats on attaining the bomb! 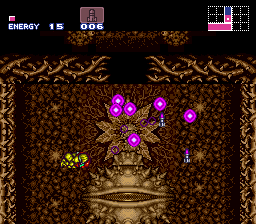 But of course, the Torizo statue explodes, revealing a hideous monster underneath. 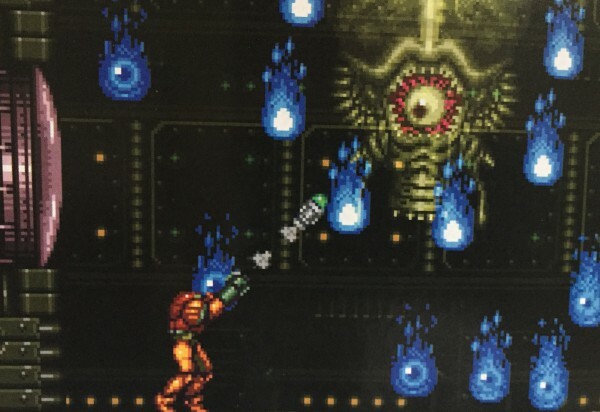 Killing a boss leaves behind a trail of goodies. 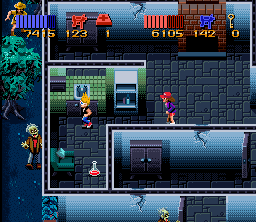 I always got a kick out of the health refills in this game — it’s like a purple Target sign! 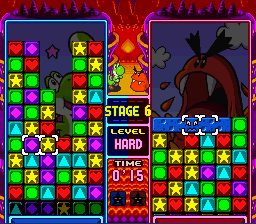 Combine different skills and power-ups to make your way through. 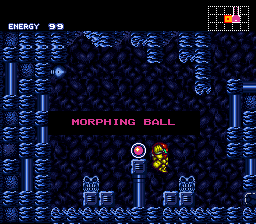 Use the combo of the Morphing Ball and Bomb to forge new passageways. Believe in the power of prayer? If not, now’s a good time to start! 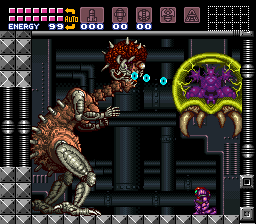 Audrey, I mean, the Spore Spawn, is a horrific plant monster that guards the lair of Brinstar. 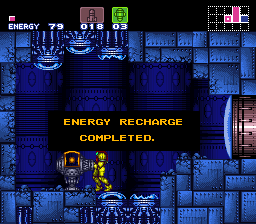 Those energy recharge capsules are a real lifesaver. 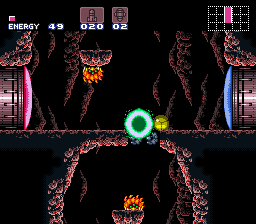 Try blasting bombs over the thinner surfaces — you never know what new ground you might discover! 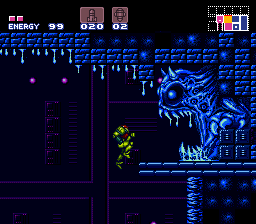 Demonic statues doesn’t deter the likes of Samus. 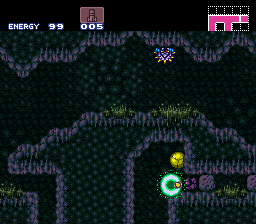 Especially not when the Spazer Beam is in your clutches. 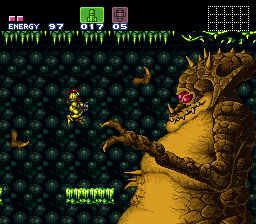 Scarcely have I seen a more impressive looking boss than Kraid. 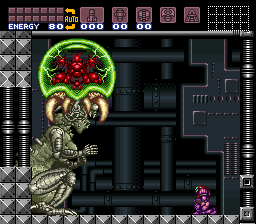 Truly a memorable sprite and one for the ages. 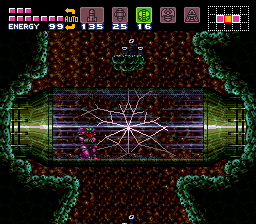 Spazer Beam can destroy certain surfaces, even. After venturing a bit in Norfair, you’ll come to the aptly named Bubble Mountain. 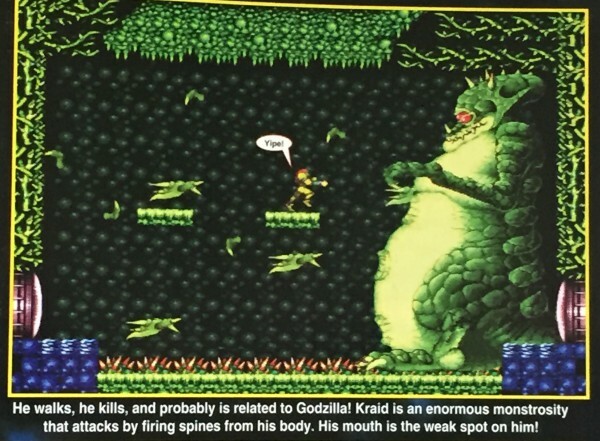 Watch out for the many bizarre and gruesome monsters that call Norfair home. 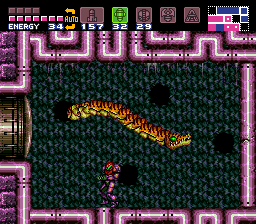 Samus is an agile sucker. 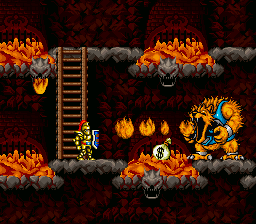 This ain’t no Sir Arthur from Super Ghouls ‘n Ghosts! 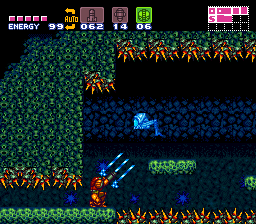 The Ice Beam allows you to freeze enemies and use them as makeshift platforms. Nice. 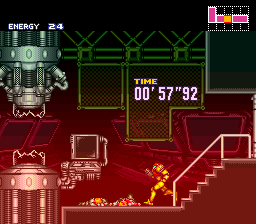 Freeze those little bastards! 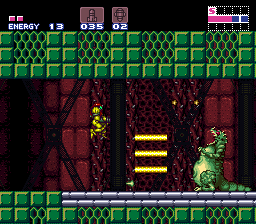 Later on, a group of Etecoons (a race of non-violent intelligent mammals) will show you how to perform the Wall Jump. 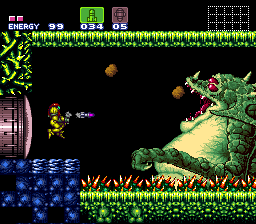 Crocomire cannot be killed by missiles or beams. 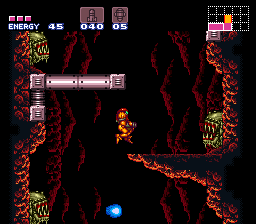 Instead, you must use your firepower to push the monstrosity into the lava. 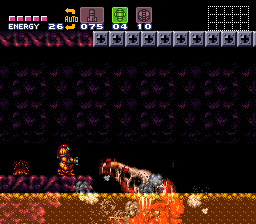 What a glorious demise! 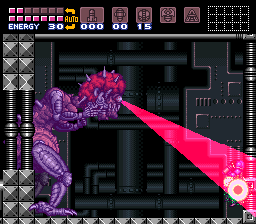 Grappling Beam further expands the game world. 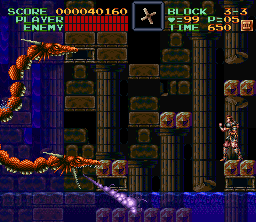 Shades of Simon Belmont from Super Castlevania IV! 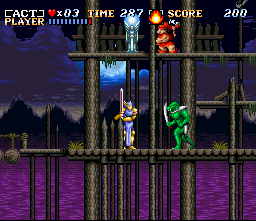 The Phantoon guards the Wrecked Ship. 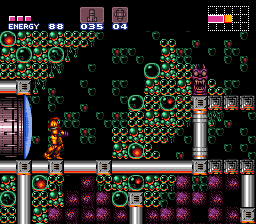 Figuratively and literally, Super Metroid shattered the glass ceiling. 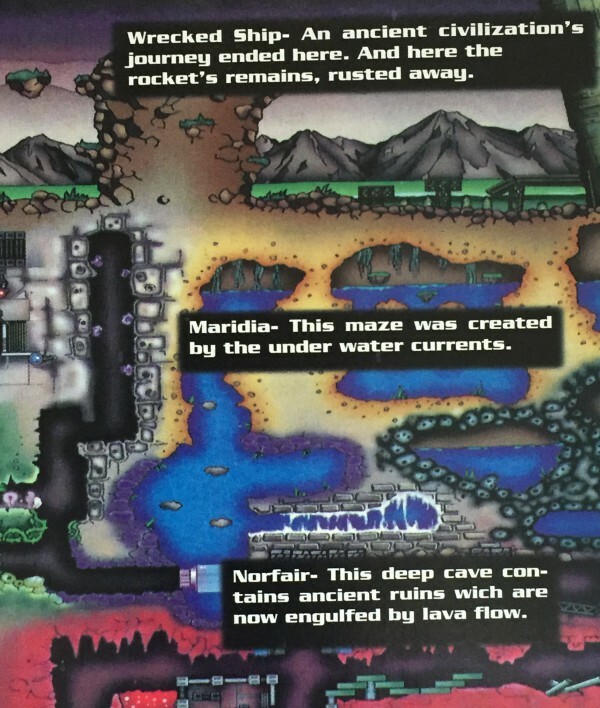 Lurking in the murky underground maze of Maridia lies a huge aquatic serpent. 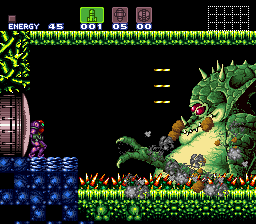 Draygon and its hatchlings are all too happy to say hello. 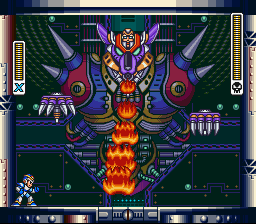 Menacing mouth inside of a menacing mouth? 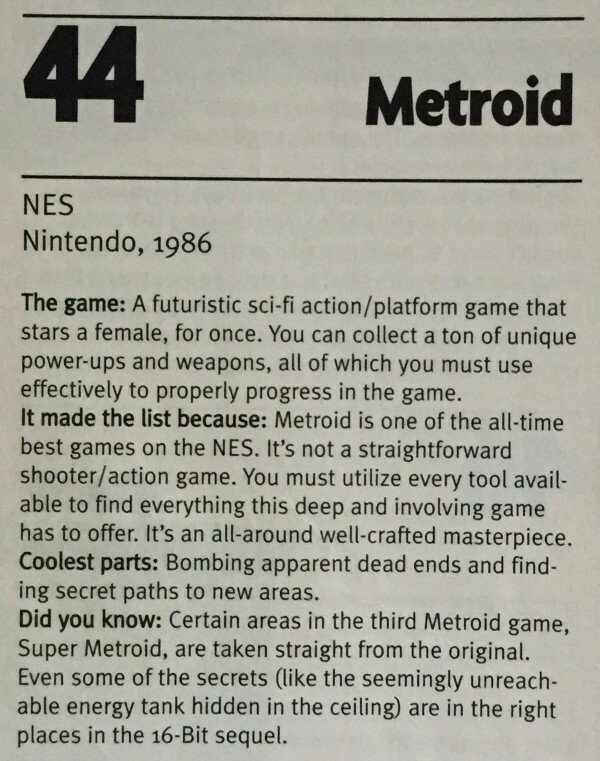 Nice one, Nintendo. 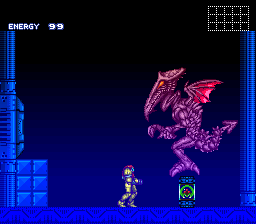 Ridley is back. 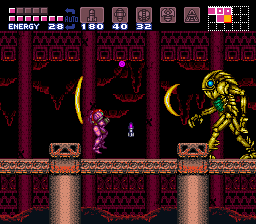 Don’t forget: no one can hear you scream in space. 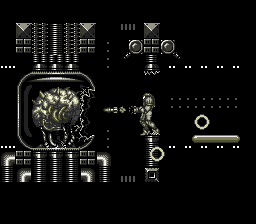 That… doesn’t look too good for you. 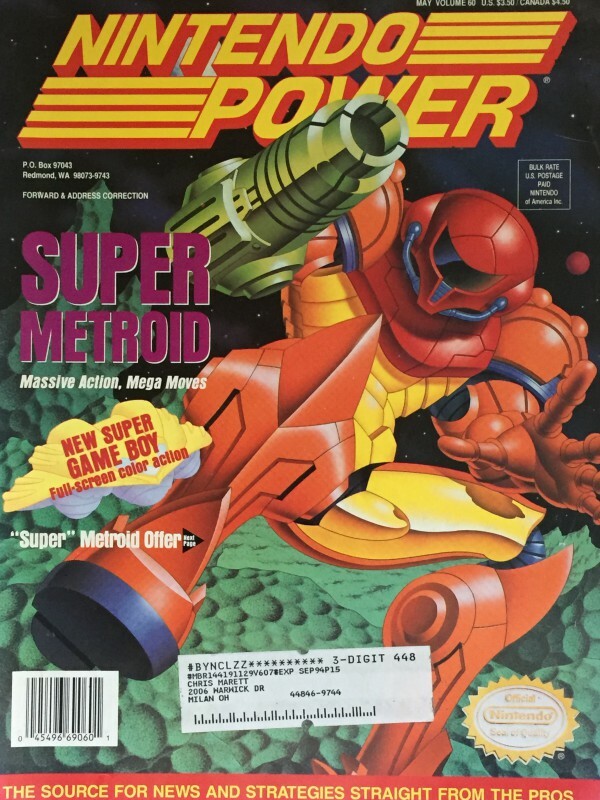 Super Metroid graced the cover of many gaming magazines. 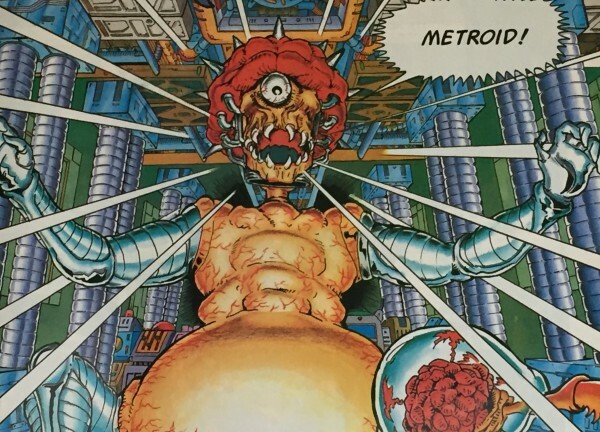 By the way, Chris Marett, if you happen to read this, I’ve got your childhood Nintendo Power issue. 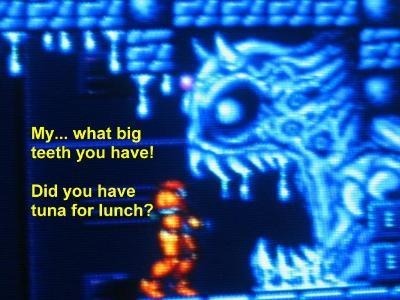 Silly Samus — we love ya! 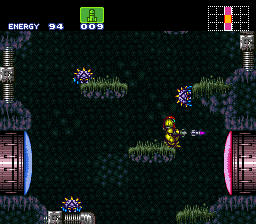 Critics and fans alike raved about Super Metroid. 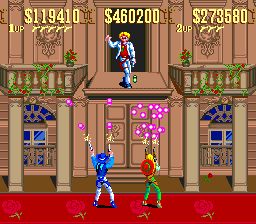 Many consider it as the pinnacle of 16-bit gaming. 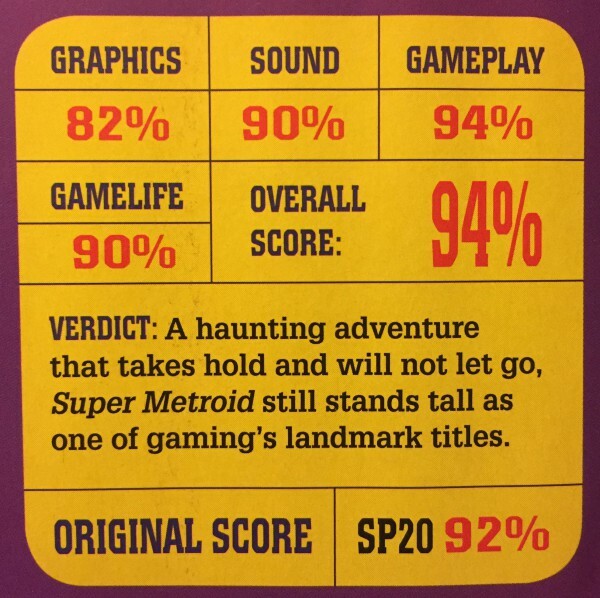 EGM gave it scores of 9, 9, 9 and 9. It earned GAME OF THE MONTH honors. 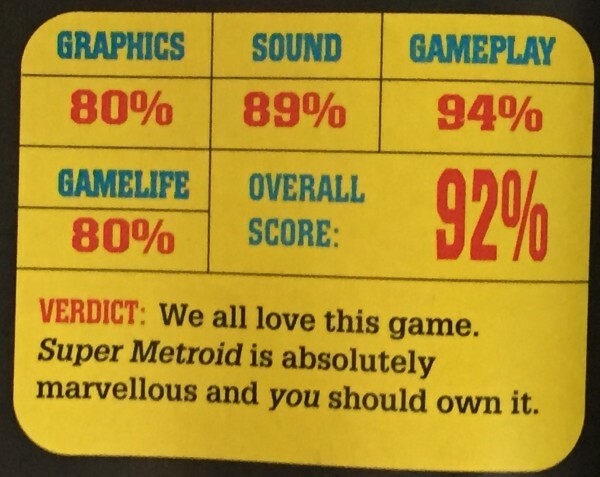 GameFan scored it 96, 98 and 98%. 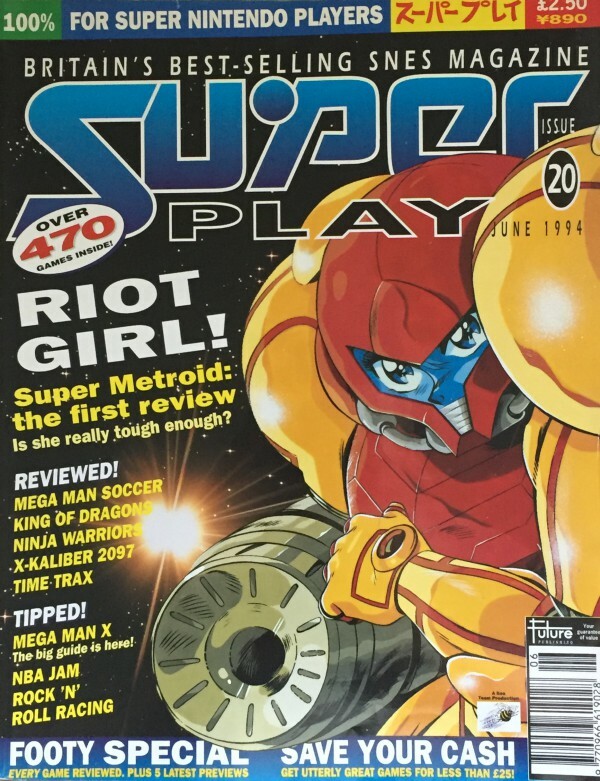 Super Play rated it 92% in June 1994 and then 94% in October 2017 in their special “reunion” issue. 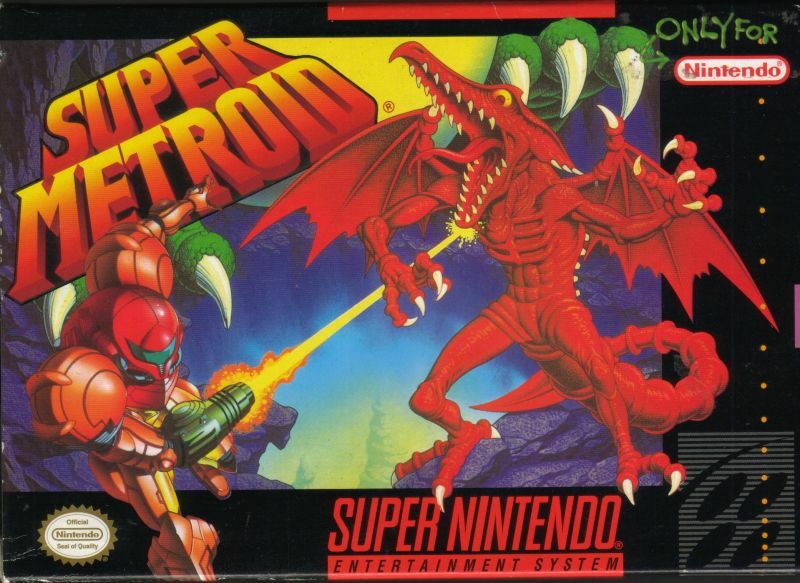 You would be hard pressed to find many Top 10 SNES games list that doesn’t feature Super Metroid on there. 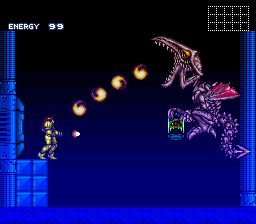 From the moment you turn on Super Metroid to the bittersweet end, you’re in for one wild ride. 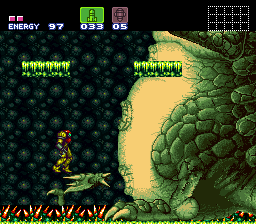 I’ll never forget finding myself on Crateria for that first time. 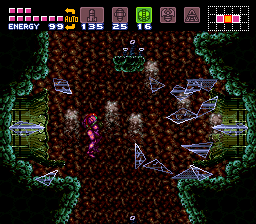 You’re being drenched in an absolute downpour as you head for shelter. But somewhere in the back of your mind, you know what lies inside (and beneath) is far worse than the terrible weather outside. You can’t help but get sucked into its gritty and dank universe. 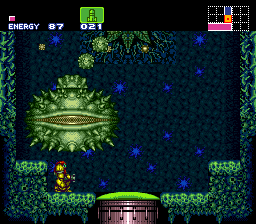 The beauty of Super Metroid is that it’s so wonderfully interconnected. 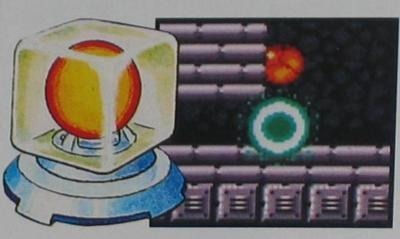 Though you may be able to access Brinstar from the very beginning, there are certain regions you cannot pass until much later in the game after discovering a brand new power-up. Then you go, “Oh yeah! 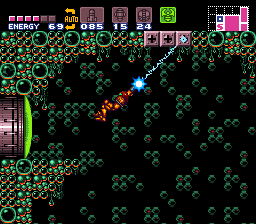 With this new ability, I can go back to X and now do Y!” And it’s all wrapped up in a very polished package. 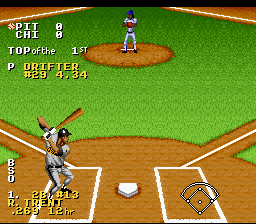 While the graphics won’t exactly wow anyone, they’re crisp and well detailed. 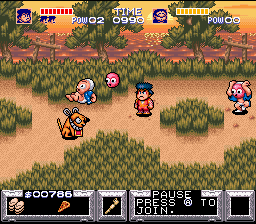 Each region has a distinct look. 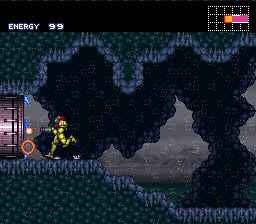 The music is highly atmospheric and different for each section with each tune fitting the respective area to a tee. Some themes are haunting and creepy, crafting a feeling of desolation and despair in the air. 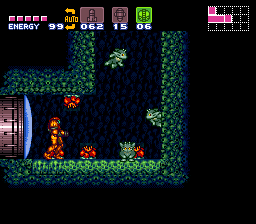 Other themes have sort of a melancholy to them that will stick to your crawl as you explore the caverns and catacombs. 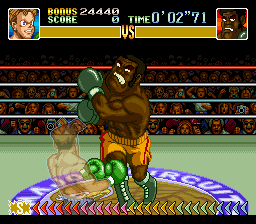 The gameplay is simply divine. 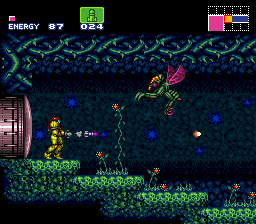 With so many hidden secrets, weapon combinations, power-ups, special techniques and so forth, Super Metroid plays like a dream. 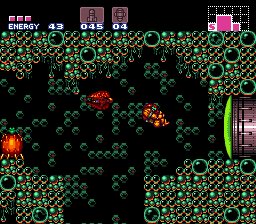 My only minor gripe is that it’s far too easy, especially with the multitude of energy tanks available. 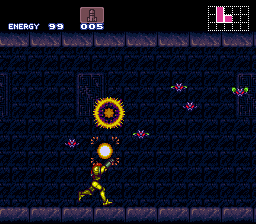 Oh that and the annoying wall jump (AKA the triangle jump). 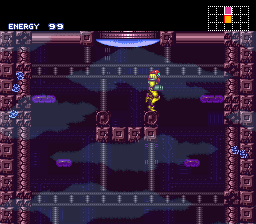 Wall jumps aren’t as easy and smooth to execute as I expected. 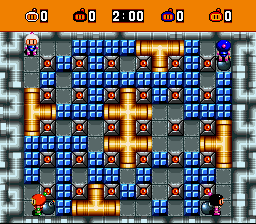 Thankfully though, there’s only one section in this game where the wall jump is required, so it’s not like it’s a huge deal or anything. 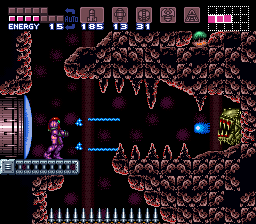 Other than those two very minor flaws I just listed, Super Metroid is virtually untouchable. Control is tight and the gameplay is a masterful concoction of intuition and discovery. 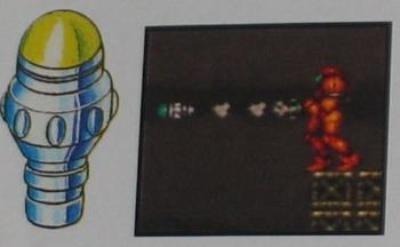 Each time you grab a new beam, item or suit, the game’s incredibly intricate design expands before your very eyes. You can’t help but love every second of it. 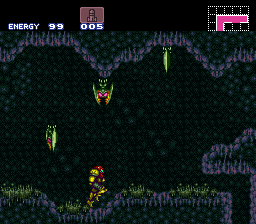 Samus is an agile sucker capable firing in all directions and swinging from cliff to cliff (once the grappling beam has been found). Hell, she can even kneel! 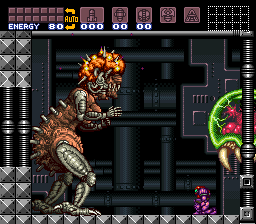 She couldn’t in the previous Metroid games and it gives Samus a whole new wrinkle. 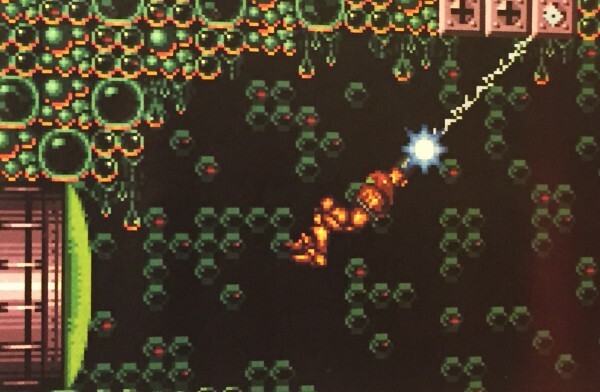 I could ramble on and on but here’s the bottom line… this is 16-bit gaming at its very best. 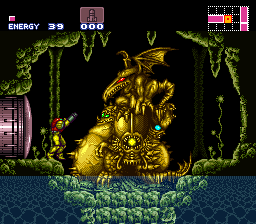 It’s clichéd but Super Metroid isn’t just a video game. It’s a loving work of art, it’s an experience, it’s lightning in a bottle. 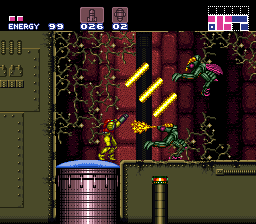 Few games on the Super Nintendo are as atmospheric or immersive as Super Metroid. 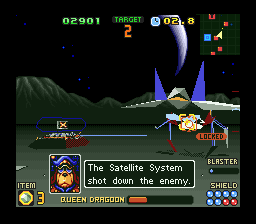 It stands as a hallmark title in the annals of gaming history.